Fracture of neck of femur often happens in old age when due to numerous causes bones to become fragile due to the rarefaction of bone tissue. The young can sometimes be fractured only with a strong shock, such as during road traffic accidents or falls from a great height. Fractures are divided into several classifications and can lead to death. Treatment can be administered conservative, just in case, if surgery is contraindicated due to various reasons. Forecasts for treatment of medial fractures is more disappointing than for the treatment of lateral fractures. Self-fusion of the medial fracture is practically excluded. Any classification of fractures differ from one another in the place of the fracture and its severity. There are 3 types of fractures of the neck, head and trochanter bone. The first symptoms of a fracture is pain in the groin area, which increases with movement, the leg can be rotated outward and the limb shortened. In some cases, if the fracture is very severe, acute pain without specific localization. It seems to a person that is breaking the whole side, the groin, and he can no longer walk. If symptoms of fracture oiled in a few days it will be impossible to walk due to an acute inflammation, and the patient will be in bed with serious complications of the fracture. At the first sign of fracture of the neck of the thigh need to go immediately to the hospital for diagnosis. If the patient cannot visit the clinic, it is necessary to put the patient to bed and call an ambulance. The most common method of diagnosis is an x-ray. If the fracture is diagnosed, the patient is immediately hospitalityat and conduct preparatory work for the operation. What kind of operation is carried out, solves only the doctor based on the results of the survey. 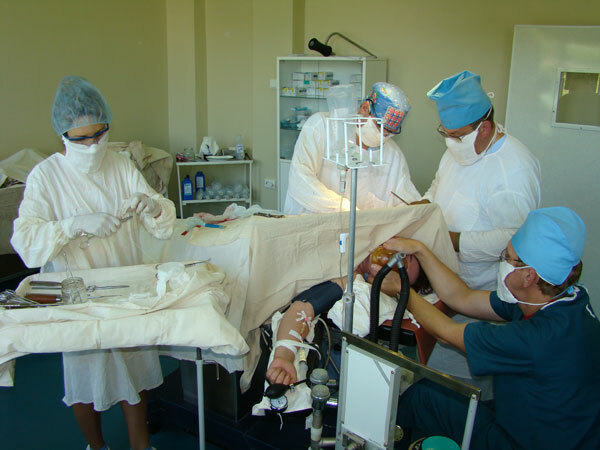 There are several types of surgical care, including hip replacement, metallosintez, osteosynthesis. If there are contraindications to surgery, the doctor puts derotation boot that is not a guarantee of splicing, especially if the patient is elderly. Patient is discharged home, where it is necessary to provide appropriate care, to prevent bedsores. Pain medications are assigned and others, depending on the indications, patient's age and the intake of other essential medicines. If there are no contraindications, is assigned to products with calcium, vitamin complexes. The patient needs to provide a balanced diet with a predominant content of vegetables, fruits and dairy products, as being in bed with no appetite, and poor work all the digestive and cleansing functions of the body. The drink should be plentiful. Above the bed should organize a Balkan frame that will raise the sacrum to prevent pressure sores. Rationally buy anti-bedsore mattresses. According to statistics, with little care 80% of elderly patients with a fractured neck of femur die in the first year after the fracture, because the person becomes absolutely weak and without nursing care will not survive.